Global Tech Protocol Master(Promaster) GT-IAD-16S16O VoIP Gateway/IAD/ATA is kind of multi analog access equipment. The WAN port can access with IP network and downlink port able to carry with multiple analog telephone. Being user access layer equipment in next NGN network, Promaster GT-IAD series voice access gateway forwards data and voice of end user into Packet Switched Network and accomplish relative functions. Processing data and voice of traditional voice service which VoIP ATA provides, it contains functions such as forwarding the data packet, processing the analog voice and streaming media forwarding. 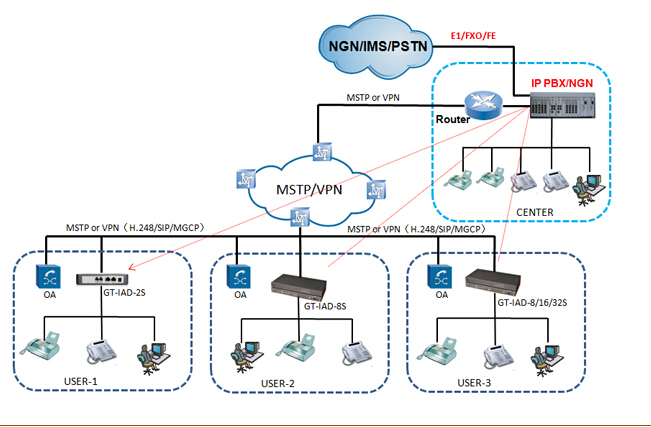 These advance features makes VoIP ATA products support existing and new service of NGN network. The unit support Call hold, Call waiting, Call forward, Do not disturb, Blind transfer, Attended transfer, PSTN Escaping, 3-way conference and so on. GT-IAD-16S16O Series VoIP gateway is 1U,19inch, modular Add and Drop design with 16FXS+16FXO. The equipment have integrated H.248/SIP/MGCP protocol. And user can select protocol VIA WEB browser. It can also support customized function development like H.248 protocol with internal call and PSTN Lifeline. ● Complete product line, support up to 128 ports of fxs/fxo. For 1U rack mounted, maximum capacity is 32 FXS/FXO/MIX. ● Support main protocol such as SIP,H.248 and MGCP in one box. End user can select by Web Browser. ● Flexible access, Strong network adaptability. Network setting support various kind of ways such as static address, PPPoE and DHCP. ● Provide data port for network connection of terminal such as PC. The equipment support Web Browser management. ● Worked and Certified by various kind of IP PBX, Soft switch, 3CX,Asterisk/Elastix, FreesPBX,Broadsoft,Metaswitch, and so on.